This kit gives you everything you need to start making your own epic 2D Action RPG. This kit includes an example town area, as well as a monster area that is common in many RPGs. NPC movement can be changed as well as the text that appears when interacting with one. 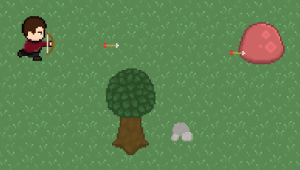 A combat system is also included that allows for the player to access weapons from an inventory menu for quick weapon changes.